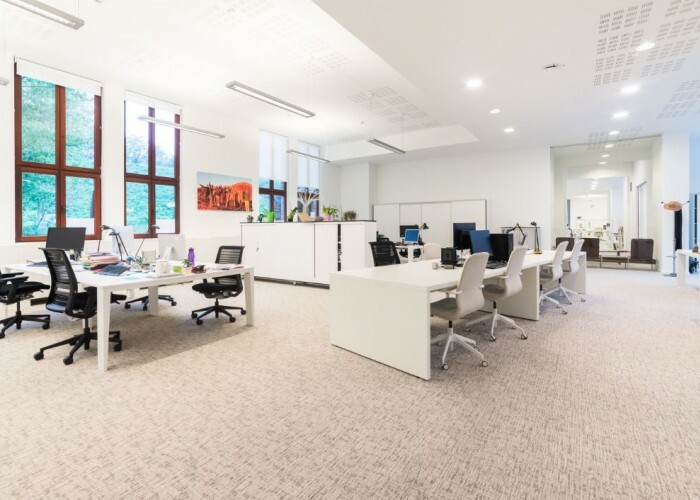 In January 2018, VO left its Forest offices and moved to Uccle, where it is now occupying one of the buildings on the Schlumberger site, owned by Mr Jean Boghossian. 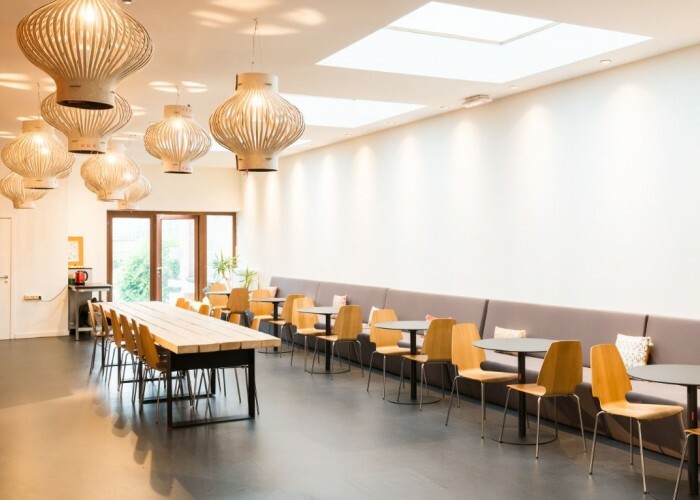 Over the 15 years we spent at the Avenue Van Volxem site, we made numerous changes that earned us two out of three stars from the Brussels-Capital Region’s eco-dynamic business scheme. These included insulating the roofs, adapting the ventilation system to improve the air quality, and choosing eco-friendly furniture and lights. Our aim was to manage our offices responsibly, and to measure our ecological impact outside of client projects. 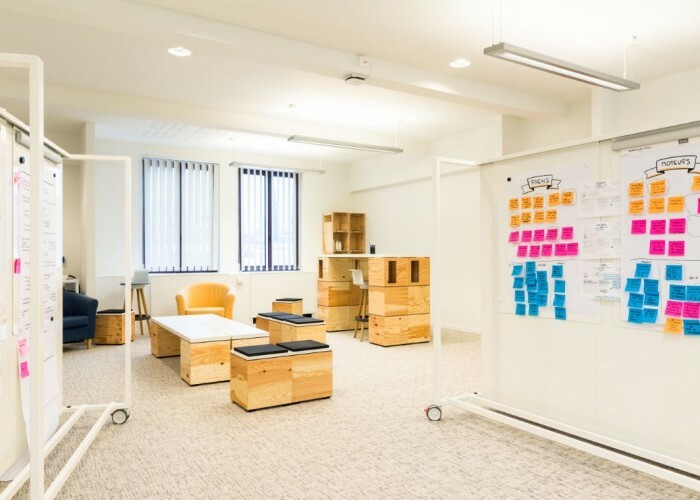 Given the group’s growth and the need to shake things up, the space available was just too limited and the time had therefore come to move to a building that would offer more possibilities in terms of collaborative work and meeting spaces. As the group had taken steps towards collaborative working and collective intelligence, our open space was no longer enough. 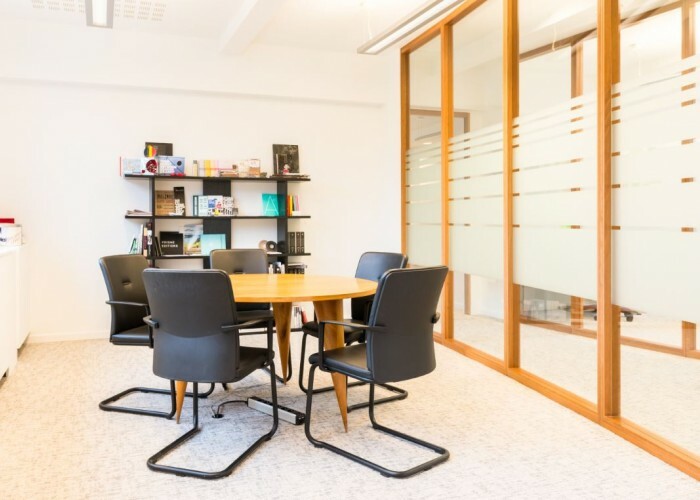 We wanted to offer varied, welcoming spaces that were nothing like classic meeting rooms, and where we could meet based on how we felt and what we needed. 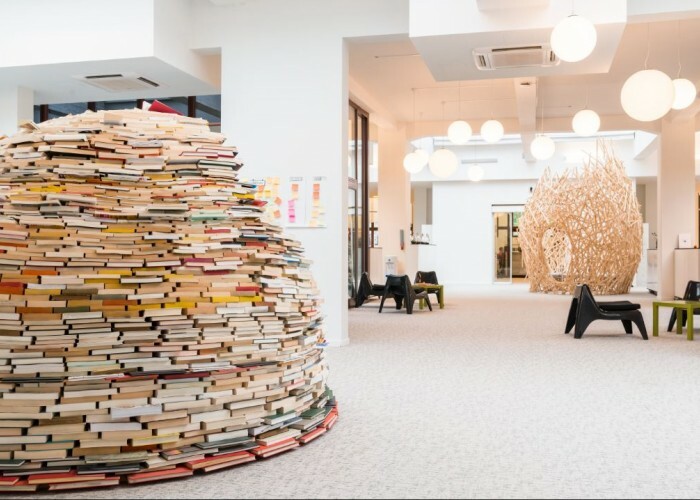 “After contacting me to come up with a concept for a private space for meetings or a quiet working area, Patrick Parmentier invited me to contact Christine Rillaerts from Buroconcept, who was responsible for furnishing the new VO offices. She showed me the different concepts for private clusters based on the images and different ideas she had gleaned from Google. I suggested making a nest from wooden slats. After browsing the photos of my tree houses and log sculptures/constructions, VO gave me the green light to create the nest. The rest was child’s play, in the form of an enormous game of pick-up sticks with 700 wooden slats and 3000 screws. The assembly was born of simple creative instinct (no plans, no feasibility studies). The form was in my head, already designed. My hands and spirit did the rest by building this nesting space. 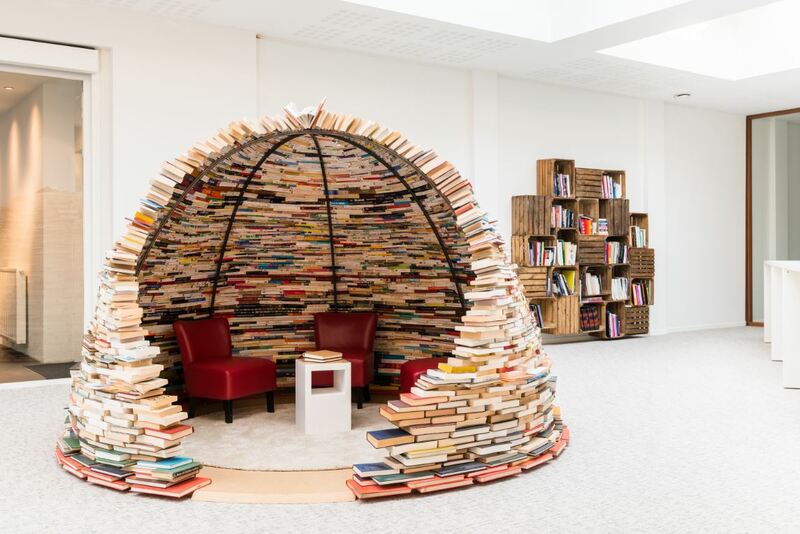 “When you explore the igloo, the expression ‘the weight of words’ makes perfect sense as it is made from a tonne and a half of books. Presenting Marguerite Yourcenar, Sylvie hôtesse de l'air, Romain Gary, Harlan Coben and the Routard Guide alongside one another, all propped up on the Universalis encyclopaedia, was a bold yet successful undertaking. 4200 books found a new lease of life. 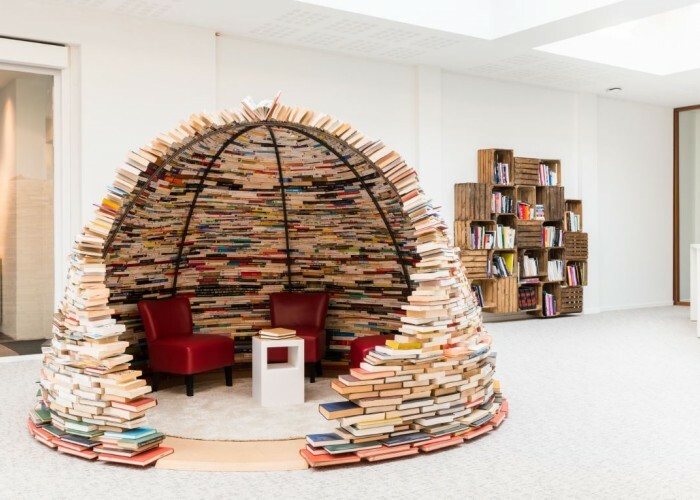 The igloo, which was designed and made in collaboration with Alex Remon, offers a strangely reassuring and soothing space that is perfect if you want to get away from the hustle and bustle for a minute and find inspiration in this unusual library, where all you can read is the titles and where the words are glued together to form a little book wall. " We also thought long and hard about the kitchen as we wanted to offer a pleasant common area. The next stage of the project is the garden and the greenhouses, which will soon be turned into indoor gardens. 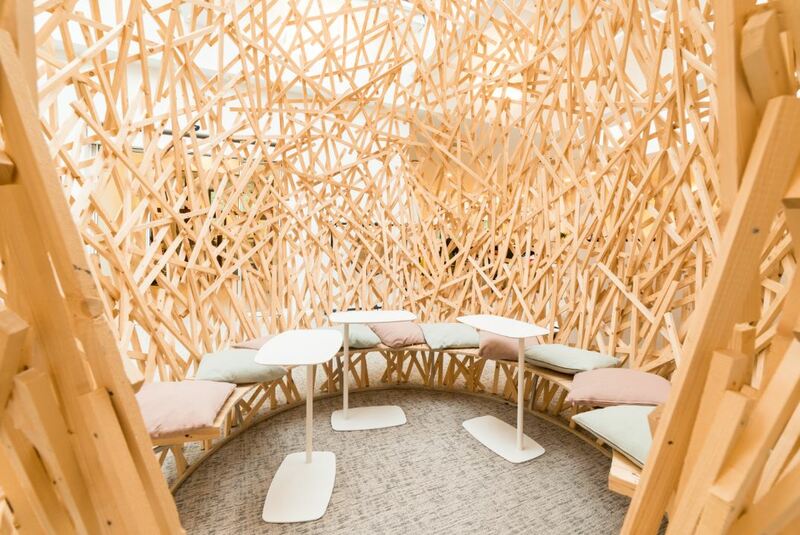 The LAB – designed to bring out collective intelligence and creativity – also has its own realm. Not to mention the investments we have made to provide alternatives to the open space, such as the standing flexdesks and the silent and booth zones. All of these changes have been warmly welcomed by our team members, who have been using them right from the day we moved in. That being said, although what we have done in terms of working atmosphere, well-being, teamwork and connecting the agencies is clearly positive, the move has meant that we are pretty much starting from scratch in terms of environmental performance. As we are no longer the owners but are simply renting a space managed by another organisation, our room for manoeuvre in this area is unfortunately limited. It is a good example of the difficulty of balancing the various aspects of CSR – we are improving things for people, profit and partnership, but moving backwards for the planet. But we refuse to give in and will be doing everything we can, from drawing up a mobility plan to buying recycled and recyclable furniture, raising awareness in-house of everyday actions, using suppliers offering 100% sustainable products, and more. And we will carry on trying to steer the owner's choices towards solutions that are as sustainable as possible.